Elena Clara Antonia Carrara Spinelli (b. 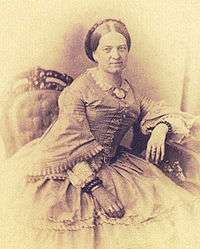 13 March 1814, Bergamo – d. 13 July 1886, Milan, of meningitis) was an Italian woman of letters and backer of the Risorgimento, usually known by her married name of countess Clara Maffei or Chiarina Maffei. 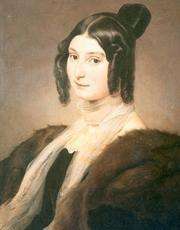 At 17 years old she married Andrea Maffei, but they separated by mutual consent on 15 June 1846. She had a long and lasting relationship with Carlo Tenca. She is well known for the salon she hosted in via dei Tre Monasteri in Milan, known as the "Salotto Maffei". Starting in 1834 and organised by Tommaso Grossi and Massimo d'Azeglio, it attracted several well-known literati, artists, scholars, composers and pro-Risorgimento figures to meet to discuss art and literature. These included Alessandro Manzoni, Francesco Hayez (who painted a portrait of Clara which he then gave to her husband), Giuseppe Verdi and Giovanni Prati. 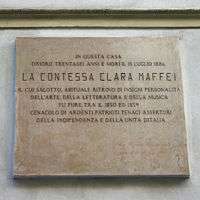 Inscription on the palazzo which hosted the "Salotto Maffei".